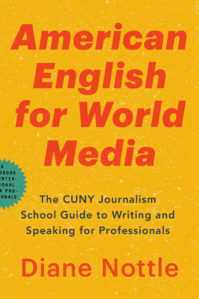 Now comes a new book that will help them: American English for World Media: The CUNY Journalism School Guide to Writing and Speaking for Professionals. Though produced by and for journalists, it can also help students and others in media and communications who may need English to advance in their current jobs, publish beyond their homelands or work in international media. A guide to the professional jargon and forms you’ll need to use from day one of working with English-language media. A review of the journalist’s No. 1 task: asking questions. Tips on quoting accurately when interviewing in a language that is not your own (and may not be your source’s). Advice on correcting and preventing the most common mistakes in writing and pronunciation. A reader-friendly A-to-Z guide (searchable in the e-book) to English grammar and usage that not only lays down the rules but also explains the reasoning behind them. For more information, an advance review copy or desk copy, or advance classroom sales, please contact press@journalism.cuny.edu.